Back in stock! My books and disks are now available for sale. My books and disks are now back in stock on this website. They are available in a variety of options in order to get the best value out of the shipping costs. The disks are very light, so up to 4 can be shipped for the minimum shipping charge. The extra thick disk is slightly heavier, so up to 2 can be shipped for the minimum shipping charge. The book is heavier, so it falls into the next shipping category, but up to 3 disks can be added for the same charge. I do all the shipping myself, which allows me to keep the costs to the absolute minimum, but a small increase in the charge is likely in the New Year. It is now getting close to Christmas, so please do not expect pre-Christmas delivery unless you are in the UK. Of course I will get all orders processed as quickly as possible, but once I have posted them they are at the mercy of the Royal Mail and international mail services! 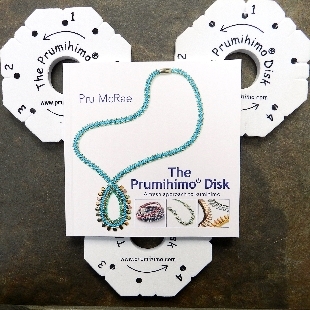 If you have not yet tried the Prumihimo disk I think you might find that it is the perfect challenge for the New Year. Learning a new skill is a great way to start the year. It will keep you occupied and give you confidence. Buying the book with 3 disks is great value. All the different purchase options are available in the shop on this website. ← No shipping of books or disks for 3 weeks!